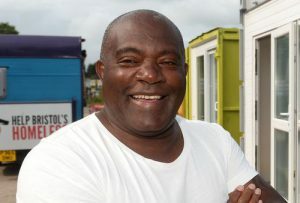 Jasper (full name Hubert Thompson) was born in Jamaica but has lived in the UK for most of his adult life. He has always tried to help those less fortunate than himself but in the last couple of years has become more and more aware of the increasing number of homeless people on the streets of Bristol. In early 2017, he and his wife started handing out hot food to the homeless on a Sunday morning in the centre of Bristol, they were soon joined by many supportive volunteers. But Jasper felt there was more he could do. Through contacts, he was offered an old mobile home, and a site to place it on. On the site was a shipping container which inspired him to start converting them into self-contained micro flats. Since then Help Bristol’s Homeless has converted 11 micro flats as well as a double decker bus and are hoping to move onto a more permanent site soon.